About 300 people are missing after a dam collapsed at an iron ore mine in south-eastern Brazil. The break caused a sea of muddy sludge that buried the dam's cafeteria where workers were eating lunch. Rescue teams used earth-moving machinery at the site near the town of Brumadinho, in Minas Gerais state. State Governor Romeu Zema said there was little chance of finding people alive. So far nine people have been confirmed dead. 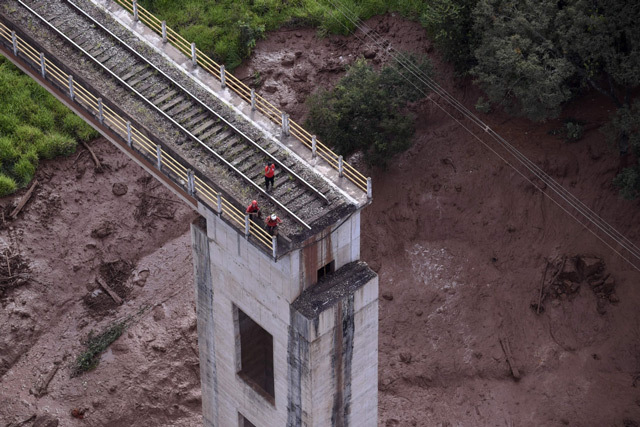 It is not clear what caused the collapse of the dam, owned by Brazil's largest mining company, Vale. The collapse comes just over three years since a dam burst in Mariana, also in Minas Gerais, killing 19 people, in what is considered brazil's worst environmental disaster.